Throughout the new Messenger Platform, companies and other organizations using bots will be able to offer services to the public through chat, without having to have a human manning an account. 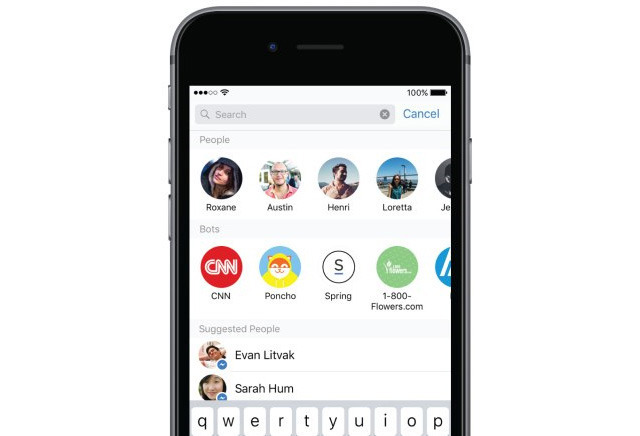 Facebook CEO Mark Zuckerberg used the example of 1-800-Flowers, which will accept Messenger-based delivery orders. Non-sales businesses can also participate. Bots will, for instance, be able to send automatic subscription content, such as weather and traffic updates. As for live content, Facebook opened its Live API to third-party developers, enabling streaming video from more than just a smartphone. One early partner is DJI, which is making it possible to push live drone video to Facebook via its DJI Go app. Another technology, Account Kit, will let people sign into an app with their phone number or email address, without requiring a password or even a Facebook account. To complete a login, users will instead have to enter a code sent to them via SMS. If the text doesn't come through, a Facebook notification can be sent instead. Zuckerberg noted that the company's 10-year roadmap involves working on technology in a number of areas, including artificial intelligence and virtual/augmented reality. Live video is simply one current area of focus —just recently the company improved its support with things like sketching and easier stream discovery.